Having designed a few fantasy themed LEGO builds in the past, I thought I’d try my hand at another, slightly larger creation. 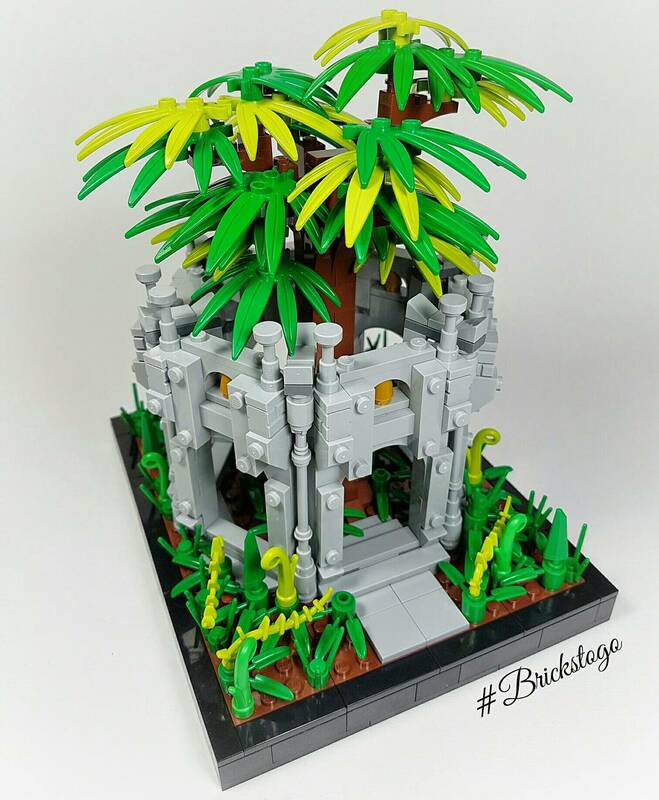 I really enjoyed the style while building my previous MOCs because you can let your imagination run wild. With this theme you aren’t trying to replicate anything realistic, which in my opinion means you have a lot more freedom for creativity. Unlike my usual builds, I actually had a fairly distinct idea of what my final product would look like when I started. 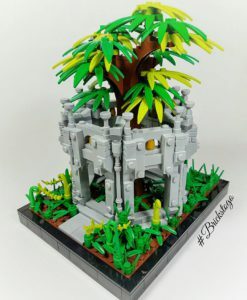 I knew that I wanted to create a tree using these palm tree leaf pieces, and then I would construct some sort of abandoned stone structure surrounding it. Regardless of how well you plan your builds, it can still be tough to get started sometimes. In this case I just started with the curvature of walls, creating a large enough area within the structure to house the tree. I used quite a few 1×4 modified plates with 2 studs just because I had a lot of them lying around. I think it creates a really cool texture on the outside of the build with the open studs. One thing that really bothered me about the build as I was nearly complete, were the large gaps that were created on the outside in between the hinges used to create the curved walls. If you’ve ever used the 1×4 hinges(or 2×2 depending on what position they’re in I suppose), then you’ll know exactly what I’m talking about. I came up with an illegal building solution, creating pillars sit within the gap and cover the rather unappealing look it created. However, because of the placement of these pillars, they didn’t line up with any studs, meaning I had to come up with a different solution to fix them in place. In the end I actually found it better to have them clipped at the top, using a 1×3 plate with a brick on the other end to create a makeshift clamp to hold the pillars in place. The rest of the build was simple, and I managed to finish up the surrounding foliage and black boarder in no time. I’m quite pleased with this build, and I definitely think it deserves an even larger scale remake some time in the future.